Bill Elwell is the owner and Chief Chaplain of First Responder Core Wellness, LLC. He has served, equipped, and supported first responders, who are the heart of our public safety infrastructure for over twenty years. He is deeply committed to supporting those in the fire service, emergency medical services, and law enforcement. 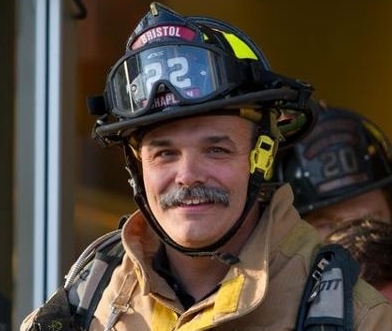 Having received an Associates in Fire Science Degree from Community College of Vermont, and being a paid on call firefighter in Bristol, VT. For over thirty- three years, he has been involved in all levels of leadership in the fire service. Working as a state fire instructor in the Vermont Fire Service. He has worked for several years as a VT State Fire Instructor and have taught numerous, classes and seminars at the local, state, and national level. As the Chief Chaplain for the Vermont State Firefighters Association, he has supported 5,000 members and their families in a variety of ways. He also serves as a Chaplain with the VT State Police Members Assistance Team, Bristol Police Department, and as a consultant to several other agencies including the Middlebury and Morristown ambulances and the Burlington Fire Department. He has been involved in public safety peer support with multiple critical incident stress management teams in Vermont and eastern, NY for 20 years participating in countless debriefings and other crisis interventions. He now holds a Certificate in Critical Incident Stress Management from the University of Maryland at Baltimore, and is an approved instructor for five International Critical Incident Stress Management courses. He became a Licensed Local Pastor in the United Methodist Church in 2000. As a seminary trained local pastor, chaplain, and first responder in Vermont and eastern NY he has provided trauma informed spiritual and emotional care to individuals, families, churches, community organizations, and businesses in a variety of ways. As a state faith based disaster recovery leader for ten years he has had the chance to coordinate the care of responders and community members in larger scale events. Bill lives in Bristol, Vermont with his wife Carrie. Their two sons Will and Nic, live with them, and a daughter, Ali lives in Washington, D.C with her husband Nick. Lori is a licensed clinical psychologist with 20 plus years of experience. She has worked in many professional capacities; She was a school psychologist for several years, working primarily with adolescents. She was on the mental health crisis team for five years, working with extreme mental illnesses and was QMHP qualified. Lori has a demonstrated history working with law enforcement professionals. She is currently serving as the managing clinician with the Vermont State Police (VSP) in their wellness program. She has a Bachelor of Applied Science in psychology and a Master of Science in clinical psychology. She provides ongoing clinical support and serves as a member on their Members Assistance Team. In her role with VSP she also provides education and training as well as consultation and direct counseling support to law enforcement personnel. Lori is trained and certified in Eye Movement Desensitization Reprocessing (EMDR). EMDR is a well. Researched method to deal with traumatic and stressful events. It is shown to have efficacy in not only treating but eliminating symptoms of PTSD. She has found this to be an extremely effective treatment for the stressors and trauma associated with first responders. She is a member of the American Psychological Association and the Vermont Psychological Association. Lori is an approved instructor with The International Critical Incident Stress Foundation (ICISF). Together with her co-teacher, Bill Elwell, they teach several classes a year. They are preparing to teach a unique Chaplaincy track, which will qualify the participants to not only be certified in CISM but also to have a Specialty in Spiritual Crisis Management. They are also working on a clinical, educational, and medical track as well. Watch the website for further details. When asked about her experience with ICISF and CISM, Lori reports that she finds the information that she and Bill share with first responders to not only be educational, but life changing with the skills and awareness it brings to their lives and to the lives of their families and support systems. It is Lori’s strong opinion that all emergency personnel should be trained in how best to support each other through peer connections, know what interventions make the most sense in a given situation and know when to refer for further assistance. It is Lori’s goal to bring this level of knowledge to all emergency services. Lori lives in Springfield, Vermont with her husband and their Chesapeake Bay retriever. She is the proud mother of two adult daughters and an amazing one-year old grandson, named Jack. Both Bill and Lori are approved instructors for the International Critical Incident Stress Foundation. In addition they are certified in Critical Incident Stress Management by the University of Maryland- Baltimore College. Together they are commited to providing the most effective education and support possible for this vital and under-served population.